Nathan Jones: There is a new ecumenical movement that those who follow our ministry have been writing in and asking us to talk about. It's this idea that the Church blends Islam with Christianity and it is called Chrislam. Could you define Chrislam for us as you've been speaking about this topic a lot? Eric Barger: I have been. I've also produced a DVD on Chrislam and have been speaking on it. It's one of my most requested seminars now, because it is something as believers we need to talk about. Chrislam is the blending of Christianity and Islam. It came from Nigeria and it is less than 30 years old. In Nigeria an imam and a Christian pastor were literally having a type of civil war with each other, but they finally laid down their guns when they started looking at what they had in common. In the case of the Christian pastor, he didn't examine what they could never have in common, because they both based their discussions around the belief that Allah is also Jehovah. Esa, or Jesus mentioned 97 times in the Qu'ran, they concluded must also be the Jesus of the Bible. People must begin to understand that by reading the Bible and the Qu'ran and comparing that Esa is clearly not Jesus and Allah is clearly not Jehovah. I personally believe every Muslim imam knows this, but they love the mileage they get out of it with the Christians who think we are being conciliatory or kind somehow by saying that we all worship the same God. Dr. Reagan: Now, you say it started in Nigeria, but it spread from there, hasn't it? Eric Barger: Yes, this imam and pastor are now traveling the world talking about the joys of Chrislam and how we can have joint services where we read both the Qu'ran and the Bible side by side. As a result of their teachings, there actually was a Chrislam Sunday here in the United States back on June 26, 2011. Several hundred churches brought a Muslim leader or cleric in and they read the Qu'ran and the Bible side by side in their Christian churches. Nathan Jones: What about in the mosques? Did they read the Bible along with the Qu'ran? Eric Barger: There weren't any mosques involved, only the churches. So, we can understand that Christianity alone is what suffers when churches begin to look at these two religions as being coequal. No imam is going to bring a Bible into his mosque and read it from the pulpit or allow a Christian to come in and talk about Jesus. Sure, they'll talk about Esa, but not the biblical Jesus. The Jesus of the Qu'ran is a prophet only. I think that everybody needs to understand that the Jesus of the Qu'ran is going to be Allah's enforcer who will eventually force everyone to become a Muslim. This isn't the Jesus of the Bible. Dr. Reagan: Churches then are going to invite false teachers to come into their church simply because they want to show Muslims that we love them and that we respect them and we care for them. We've come a long way from the times of Elijah, haven't we? Eric Barger: We have. Now look, I would go anywhere, and I've been criticized for this, and preach in the presence of the cultists if I could. I would be misunderstood for doing so, but I believe that's where we are supposed to take the truth. But, in this case, this is outright a promotion of Islam by these pastors' claiming that Islam is equal to Christianity. What they are really saying is that both religious paths lead to God. It is truly a form of Limited Universalism. Dr. Reagan: Here's a quote from John Ashbrook: "A debate is a conflict which clarifies a position. A dialogue is a conversation which compromises a position." Eric Barger: Wow, that's a powerful quote! Dr. Reagan: When it comes to talking about dialogue, which in this case started at Yale University, what's meant when we get together for dialogue is not to talk about differences, but to talk about where can we say that we agree and also to forget about any differences. 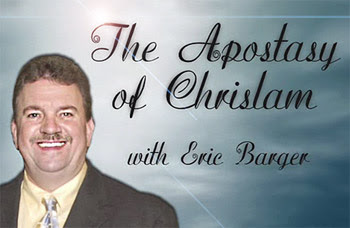 In the second segment of this series with Eric Barger on Chrislam, we will compare and contrast Islam's Allah with Christianity's Jehovah God. This kinda reminds me of those "Coexist" bumper stickers with the letters symbolizing various religions and beliefs.